Morning arrival at Chinggis Khan Airport in Ulaanbaatar, transfer to the hotel, after breakfast short break, city tour including Gandan Monastery and the National Museum of Mongolia. After lunch in the city we will visit the Choijin Lama Temple Museum, dinner at the hotel. 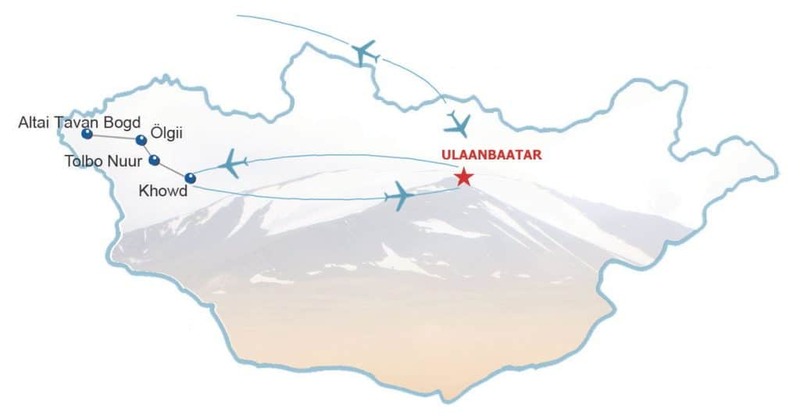 Early morning we fly to Khovd, the provincial town of Khovd Aimak. This area is the basin of numerous picturesque lakes and rivers. Transfer to our ger camp close to the town. In the afternoon we hike in direction of Nature Reserve Khukh Serekhiin Nuruu (approx. 10 km). In the morning short drive via village Erdeneburen to the fourth-largest mountain Zambagarav Uul (4,100 m). 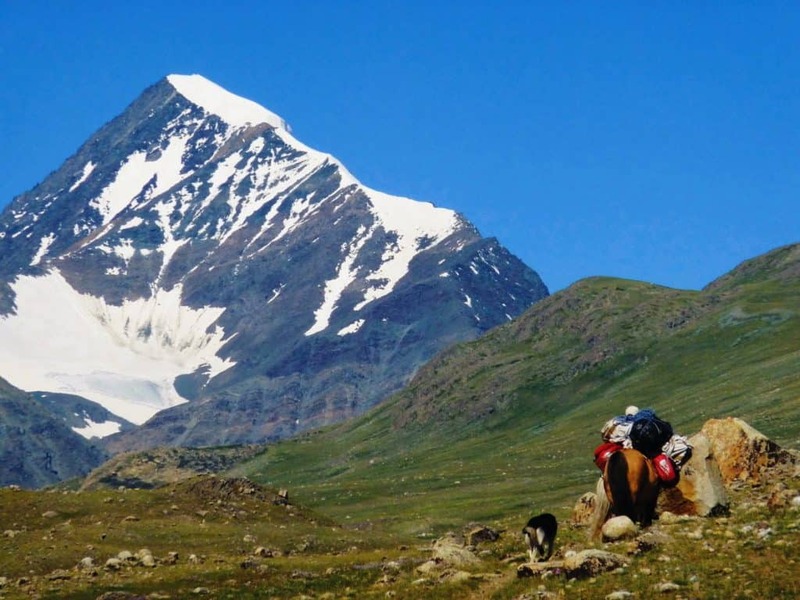 This mountain is located on the border between Khovd and Bayan-Ulgii Aimaks. In the afternoon we will hike (approx. 15 km), stay overnight in tent. Hiking day to the mountain (approx. 20 km), stay overnight in tent. Today we drive to the provincial town Ulgii in western Mongolia. In the afternoon we arrive at the lake Tolbo, short hike at the lake (approx. 10 km), stay overnight in ger camp of the Kazaks. In the morning, we drive west to the Altai Tavan Bogd National Park, on the way the village Tsengel, where we visit the centre for “Community Based Tourism”, in the afternoon we ride (about 2 hours), stay overnight in tent. Our bus-jeep will drive us back to Ulgii. 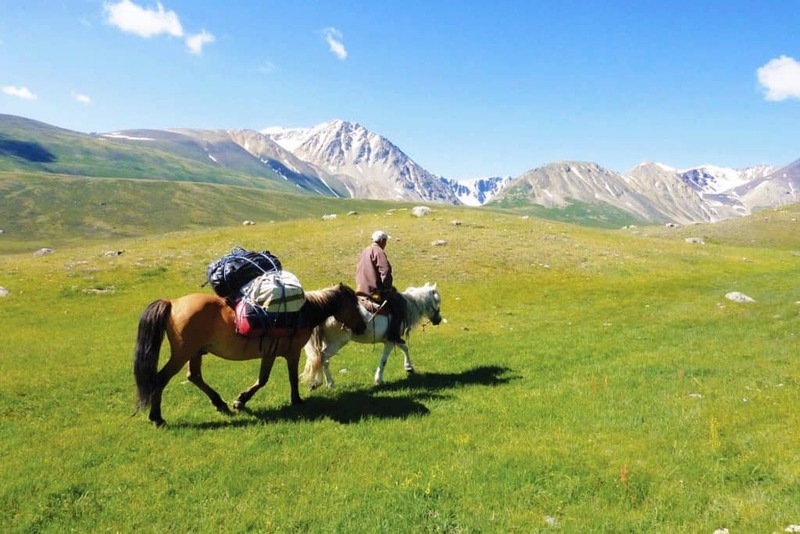 Today we begin our hiking and riding tour with the pack horses to the Mongolian Altai Mountain Range along the river Tsagaan Gol with the accompaniment of a local horseman. We will continue our journey sometimes by foot sometimes on horseback about 10 – 15 km daily. On the way we visit nomadic families such as Kazakhs and Tuvans. In the afternoon, we reach the valley of Tsagaan Shiveet Uul, where our driver will be waiting for us, farewell dinner with our horseman, stay overnight in tent. Today we drive south-west to the beautiful mountain lakes Khoton and Khurgan Nuur in the National Park Altai Tavan Bogd. In the afternoon we walk along the southern shore of the lake and visit to the local nomads (approx. 20 km). Stay overnight in tent north of the Lake Khurgan. Today we have a hiking day to Khoton Lake, afternoon back to our campsite (approx. 20 km). In the evening campfire is possible. In the morning we will drive to Ulgii, after arriving in the provincial town visit to the local market and museum, buying the local handmade products is possible. Stay overnight at ger camp of the Kazakhs. At midday flight back to Ulaanbaatar, in the evening farewell dinner with folklore. Stay overnight at the hotel. Early in the morning transfer to the airport and departure.